Aaron Rodgers went 30 for 42 for 281 yards and a touchdown pass to Davante Adams. But Rodgers also fumbled on a run-pass option, then took a sack on the very next play that pushed the Packers out of field goal range. After a slow start last week, Rodgers got things going with tight end Jimmy Graham, to the tune of 6 catches for 95 yards. The Packers problem on offense was their inability to get multiple touchdowns in the red zone. They settled for Mason Crosby field goals five times. Crosby also missed a sixth opportunity, from 52 yards out that would have won it in regulation. The Packers were also victimized by a roughing the passer penalty called on Clay Matthews. Replay shows it was a bad call, but it wiped out a Jaire Alexander interception on the play. It’s the second straight week that Matthews has been penalized for a roughing the passer penalty. The first one was deserved, but the hit against Vikings quarterback Kirk Cousins appeared to be legal. 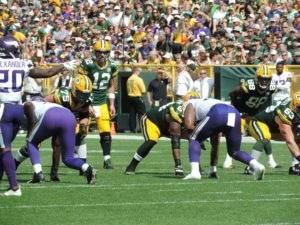 The Packers first score came on a Geronimo Allison blocked punt in the first quarter that was recovered in the end zone by rookie Josh Jackson. Packers punter J.K. Scott was a quiet hero as well, changing field position several times with long punts. He averaged 51.8 yards on five punts with a net average of 45.2 and a long of 63 yards. The Packers remain tied with the Vikings for first place in the NFC North at 1-0-1 on the season. They’re at Washington D.C. to face the Redskins this coming Sunday.